The Senate now has its original red color. 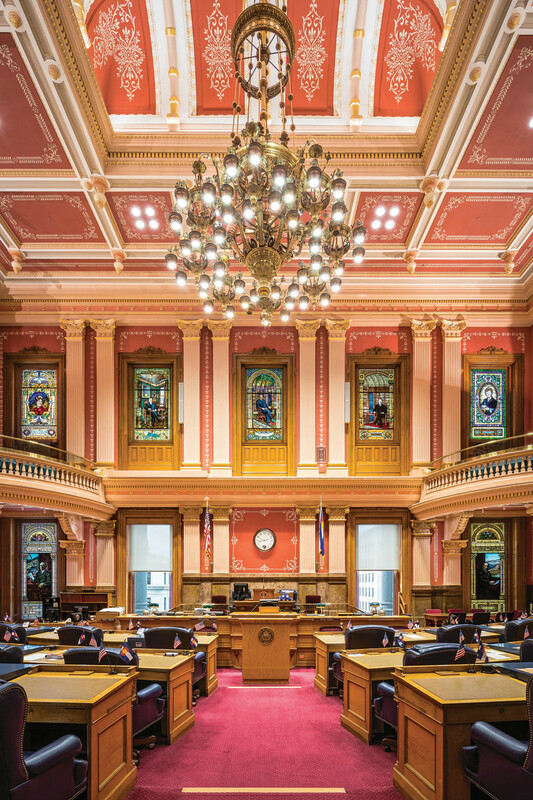 What started out as a simple radiator repair job turned into a complete restoration of the House and Senate Chambers at the Colorado State Capitol in Denver, CO. 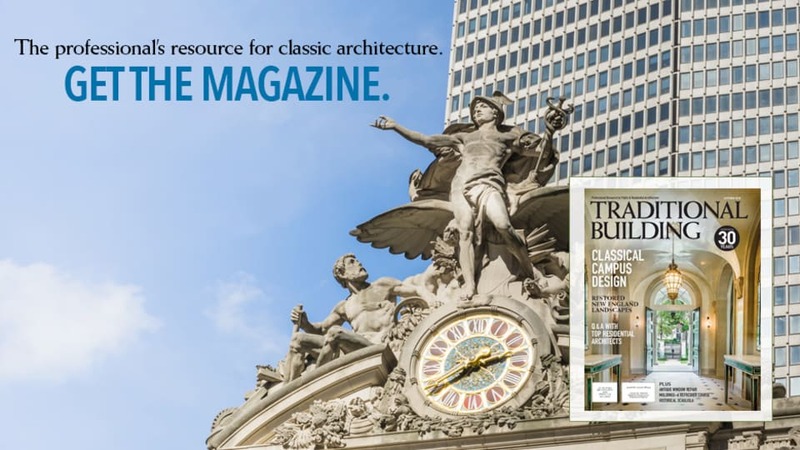 This three-year, $5,389,500 project returned both chambers and the connected offices in this historic building back to their original beauty. Completed in 2016, it involved quite a bit of research, many tradespeople, and some serendipitous good luck. 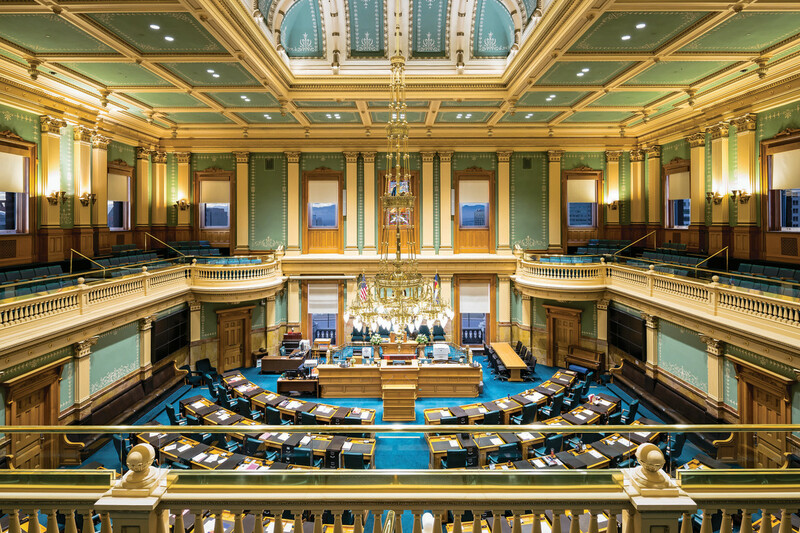 The Colorado State House is now restored to its original green color. 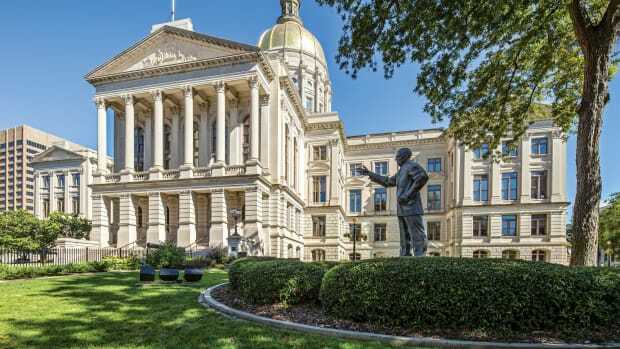 The historic, 1894, six-story structure incorporates a tower that reaches a height of 272 ft. and contains almost a quarter of a million square feet of space. 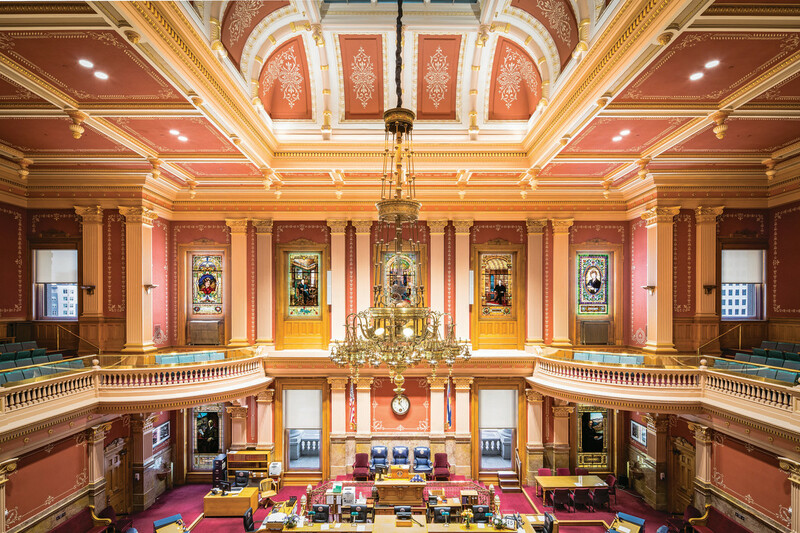 With its gold dome (added in 1908, it was originally copper), the building is a beacon in the Rocky Mountain state. 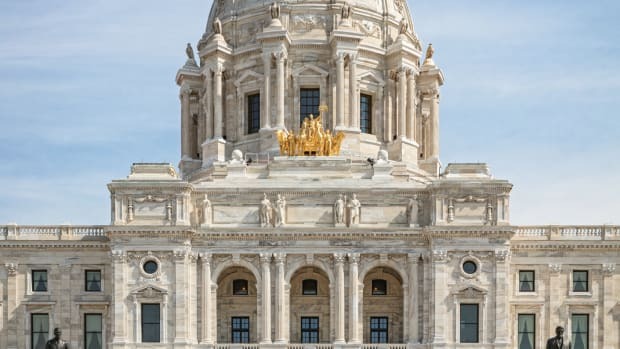 It was designed by Elijah E. Myers in the Neoclassical style to be reminiscent of the U.S. capitol and is constructed primarily of Colorado white granite. Then in 2013, the capitol management team decided to repair one of the radiators in the House Chamber. 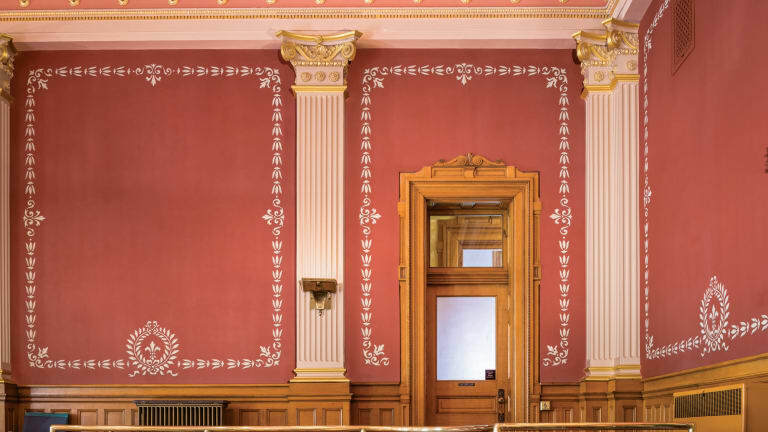 The removal of acoustical tiles near the radiator led to the discovery of beautiful, hand-stenciled original plaster walls. The client’s decision to restore the original historic character of both chambers with a full rehabilitation evolved as discoveries were made during initial investigations. House Chamber Administrator, Marilyn Eddy, was an early proponent of the expanded rehabilitation project. “We started the radiator repair by taking a look at the painted cork panels (acoustic tile) on the walls that had been added in the 1950s,” says Anderson. “They covered everything and were painted beige. When we checked behind the tiles, we discovered that the original stencils and original painting was still intact behind these panels.” Research of historic documents and photos confirmed that the walls of both houses had been beautifully finished with stencils around 1905. This original filigree stencil work had been done by Denver artist Manuel Hill. The design team also found that each 1x1-ft. 1950s acoustical tile was attached with dobs of horse glue, which could only be removed by hand rubbing. They also discovered ghost images of murals that would have been painted even before the stencil designs. These were thought to be mock-ups or mural options before the final decision was made. 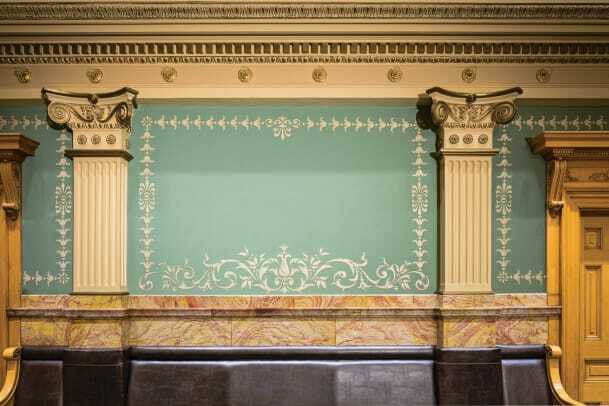 The craftspeople began by carefully removing these acoustic panels and restoring the walls to their original colors—green for the House and red for the Senate—and recreating Hill’s stencil designs. During the exploration, they found that there were 12 different custom-mixed paint colors in the House and 10 in the Senate. All were reproduced from paint analysis. When the tiles came down, the original skylights in the House and Senate chambers were uncovered. These two skylights, each 30x30-ft., were restored as was the metal trim work around them. 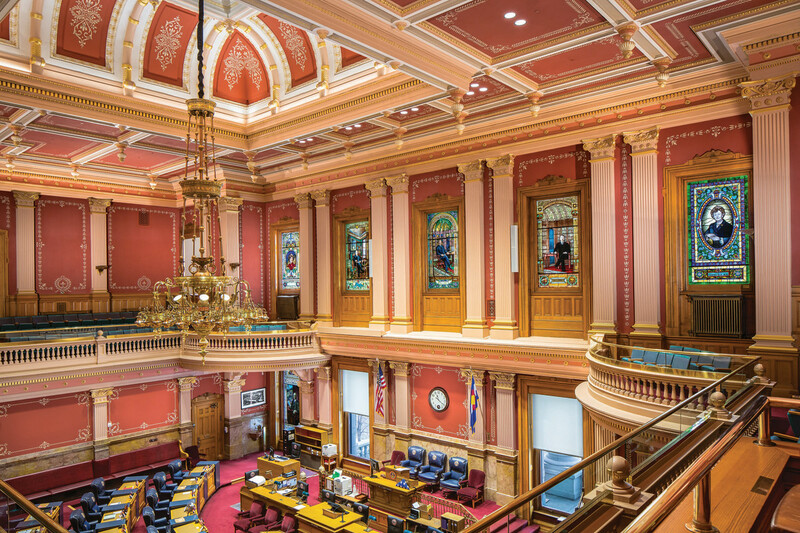 The two 48-light chandeliers in the House and Senate chambers were refurbished. 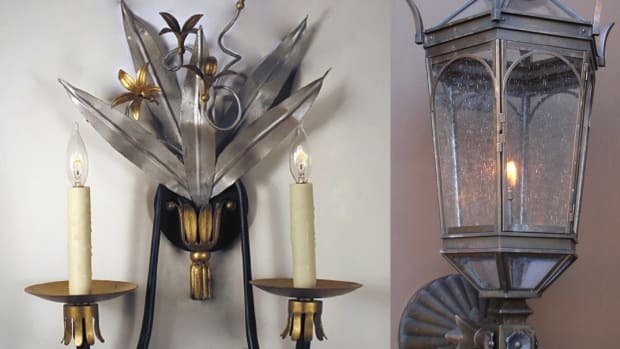 By chance, Anderson was able to acquire one of the original globes that had been removed in an earlier restoration, so they were able to recreate these (but without the etching) for both chandeliers. The lighting plans also called for the restoration of the two 50-ft. chandeliers, one in each chamber. While work was going on, by chance Anderson happened to meet a man at a Christmas party who said he owned one of the original etched globes from one of the chandeliers, which had been removed in the 1950s. “You could tell from the historic photos that this was original,” says Anderson, noting that the globes were about 10 in. tall x 5 in. dia. The globes were reproduced (without the etching because of budget reasons) and put back on the chandeliers, which were restored and updated with LED lighting. Each chandelier has eight arms with six globes on each arm, for a total of 48 globes on each fixture. All of the windows in the chambers were cleaned and restored, including the 17 stained-glass panels each measuring 4.5 x 7.5 ft., located in both chambers. This work was done by Watkins Glass of Denver, a third-generation firm that has been working on the capitol over the years. The stained-glass windows honoring different legislators had been originally built by Watkins. 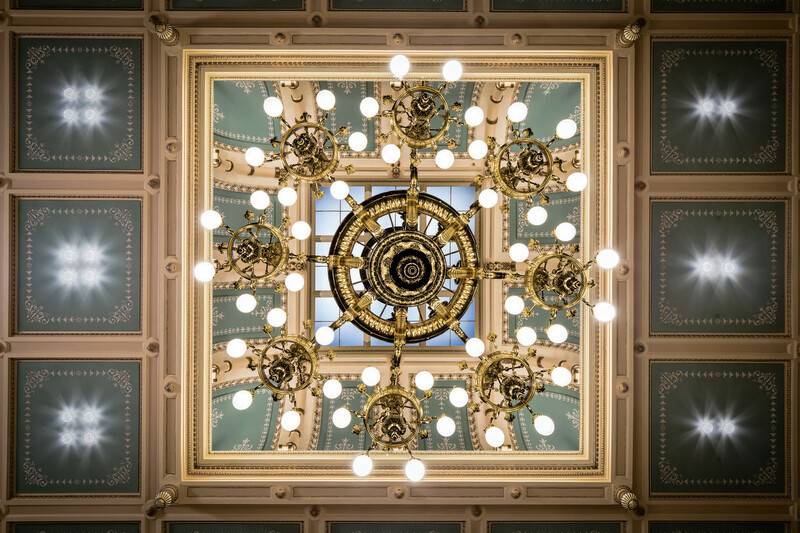 This dramatic view of the refurbished chandelier in the House chambers looks directly up at the historic fixture. 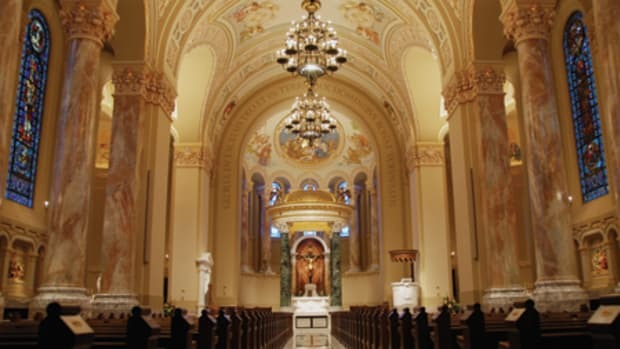 In the second year, the scaffolding went up again and the ceilings and skylights were restored. No scaffolding was required for the third year when the gallery seating was replaced and fireproofing was addressed. All 17 of the stained-glass windows in the chambers were restored. 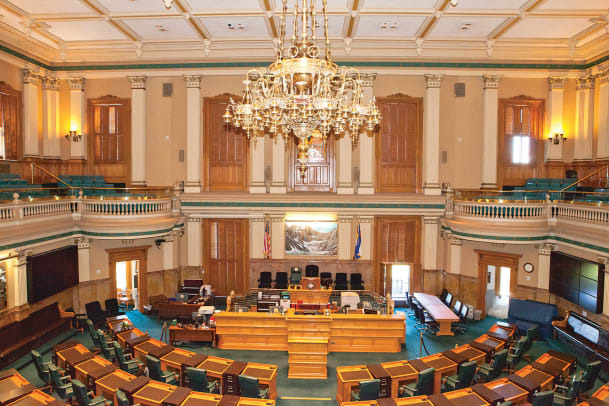 Shepherd adds: “The Denver capitol is the first—and only state capitol building—to be certified LEED EB, and we have since gone to LEED Dynamic Plaque to maintain that.” Currently work is in progress in committee rooms and on the windows.